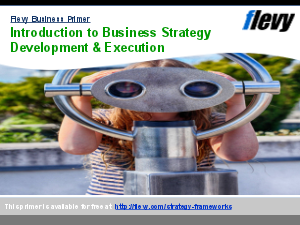 This training course provides a fresh and novel perspective into the realm of strategic planning. Basically, it redefines the success formula for Strategic Planning. Main objective is to pursue success and avoid failure more systematically. Success and failure are demystified with this training course. One of many examples addressed is the statistical fact in the USA and Europe that some 45% of SME start-up businesses fail after three years of launch. This training material looks at the cited causes of failure of SMEs and explains this phenomenon, and presents the remedy formula. Presentation incorporates multiple novel templates and matrices. It deals with organizational success, including SMEs, but also success and failure of of individuals. Training course can be used as a TEMPLATE INTRODUCTION to any business and management training, including strategic planning and management, business plan, market research, marketing strategy, balanced scorecard, blue ocean marketing, business model, innovation, how to be successful etc. Success Appraisal CHECKLISTS are incorporated in the final section for immediate checking, for the purpose of identifying the elements that are missing in your current success combination. Separate checklists are provided for businesses and for individuals. This success system was developed by Dr. Stephen M. Sweid, a business consultant, researcher and trainer with over 20 years consulting experience on the international scene: Europe, USA, Middle East and Far East. Strategic Planning? Supply Chain Analysis? Bain Frameworks? Or something else.